Told in a series of brilliantly rendered observations and episodes from Billy’s life, this is an unflinchingly vivid journey to a place of no return, where love is lost in the darkest of woods – a boy, who becomes a man, who becomes his own worst devil. In 2002, Dean Lilleyman, drunk, left a warehouse job and went home. He stayed at home for six months and got sober. Then he went to college to get some qualifications (at the age of 35) where he read Raymond Carver and started writing short stories. By 2013, he had won several awards for his writing, been awarded an MA scholarship, written a novel, and lectured in creative writing at a university. 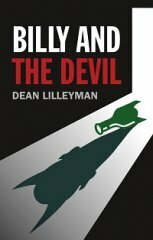 Billy and the Devil is his debut novel. He is currently working on his second, whilst rebuilding a house, talking to cats, and tending to his chickens. This is book of dark humour and harrowing tales is one of the exceptional pieces of creative writing in the history of everything. Billy woz ere. The reader is spared no secrets, it is all laid out for us to make our own judgement, I really enjoyed Billy & The Devil, a standout for me.